A few times a year, Microsoft gathers up few of its best upcoming arcade games and gives them a serious media push. Last time it was Summer of Arcade and its flagship was Limbo. This time it is Game Feast, and first in line is Hydrophobia. An action shooter/platformer touting an impressive hydrodynamics engine, this title has got some big shoes to fill. Let’s see how it did. 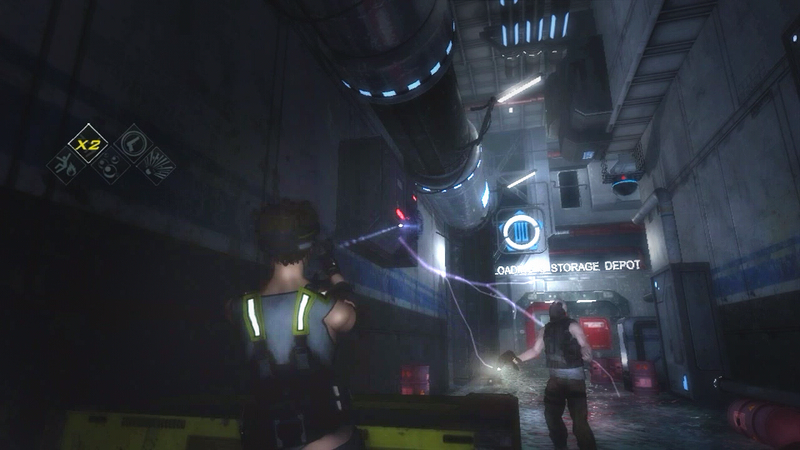 If there is a single word that could describe the graphics of Hydrophobia, it is ‘deep’. There is a remarkable amount of detail from the very first moment of gameplay. You begin in an apartment, and soon move into utility hall ways, claustrophobic vents, flooded elevator shafts, and wrecked plazas. Every inch of the way is packed, some might say cluttered, with details. Before long you find that the detail extends into a whole second layer, as a device called a mavi gives you a neon, x-ray style view that uncovers otherwise invisible details of the walls and ceilings. It can actually get to be a little bit too much at times, but we’ll expand upon that in the gameplay section. Important items pulse with relevant colors, from blue for collectibles to red for hazards to green for lootable bodies, making the needles stick out of the haystack just enough, and mavi view gives you highlighted overlays on virtually anything interactive. Animation is good, particularly the climbing and swimming motions of the protagonist. 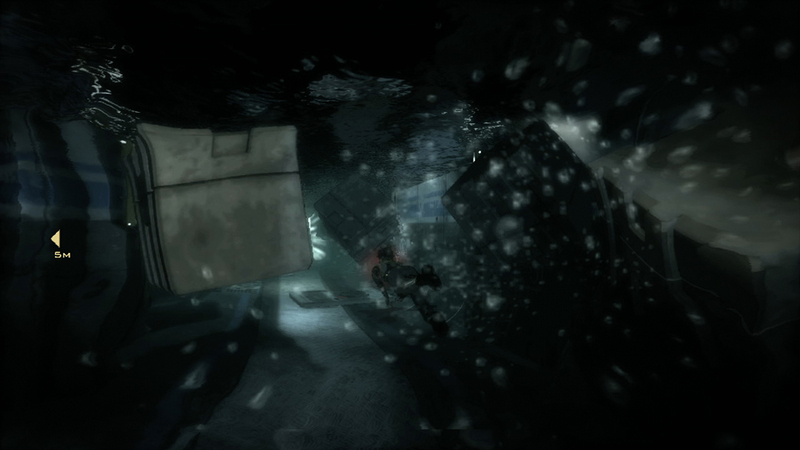 Character models are above average for an XBLA game, and special mention should be made of the underwater visuals. Explosions and bullet wounds underwater are an entirely different animal, filling the area with scarlet billows that look like they ought to be attracting sharks. Water is the real claim to fame for this game, and I must say that it is excellent. Since the game takes place in what is technically a ship but more accurately a floating city, water is in no short supply. 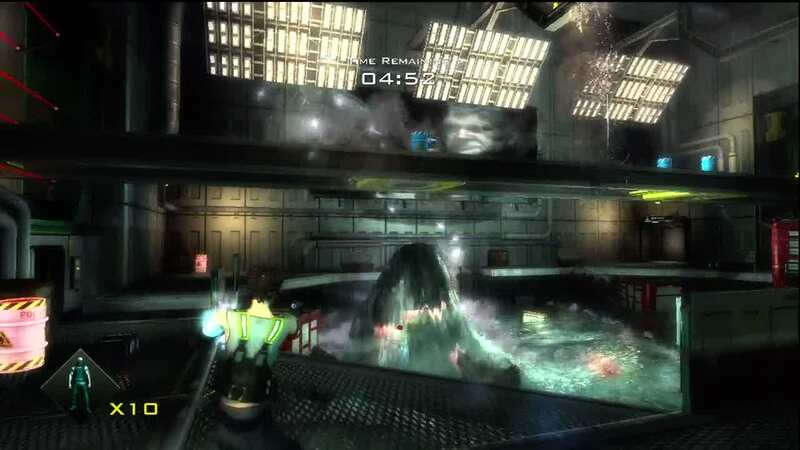 Whereas water in most games is just a plane with a fancy effect on the surface, Hydrophobia makes it a truly fluid and dynamic part of the game world. It rolls and swells and ripples with realistic motion, splashing on the camera, bursting from the walls, and pouring through shattered glass. Dump enough of it into an area and you are treated to floating pools of burning oil and arcs of electricity jumping to the surface. The rippling, silvery look of the surface from below is excellent, and actually essential, since once you’ve been submerged long enough, you’ll be desperate to hunt down an air pocket to catch your breath. Either that or treat yourself to one final, spasming animation. 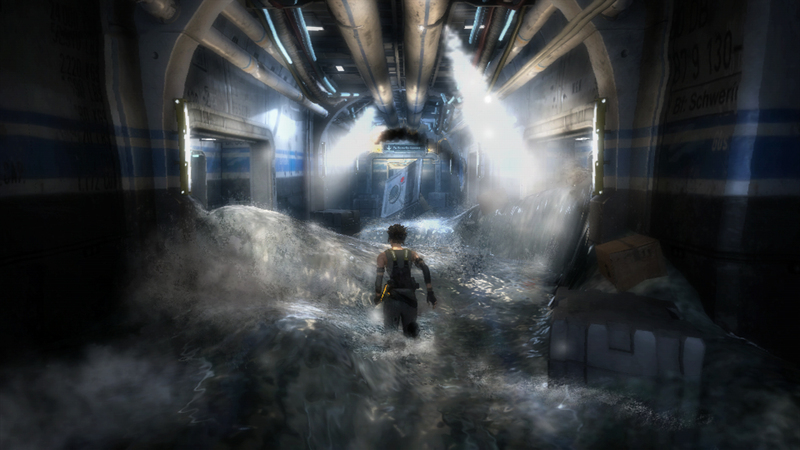 Like the graphics, the gameplay of Hydrophobia is deep to a fault. The first piece of the puzzle comes in your climbing and platforming. We aren’t talking the parkour that has taken hold of the industry ever since Prince of Persia. This is more reminiscent of the original Tomb Raider games. You climb, jump, and shimmy along ledges and rails that are scattered about the walls. You can interact with virtually anything that looks like you can interact with it, which is great right up until you factor in the aforementioned graphical detail. The environment is loaded with things that you can dangle from, most of which don’t really lead anywhere. It has a sort of “cry wolf” effect after a while, making you dismiss valid routes to high catwalks and vents as mere graphical fluff at first. Eventually, though, you start to develop the usual path-finding instincts and it starts to fall into place. 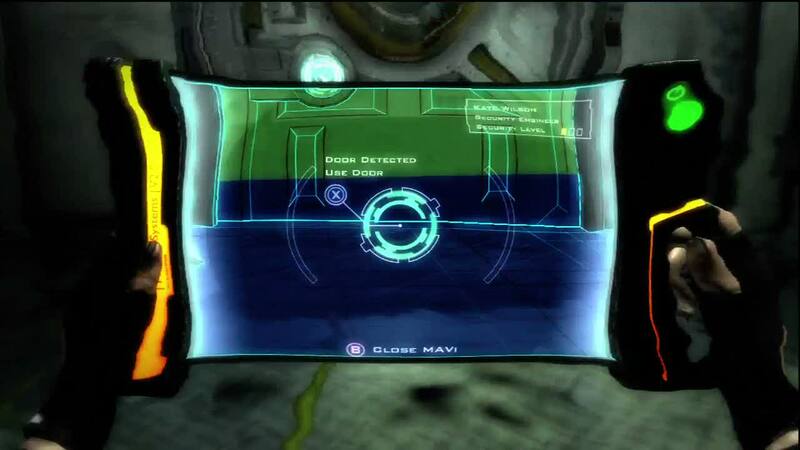 The next aspect of the game to reveal itself is the neat Mavi system. This is a device that shifts the game into first person and provides you with an overlay for the world. You use it first to find hidden messages on the walls, but working your way through the game expands its abilities to hacking consoles in a frequency matching mini game like you find in Arkham Asylum. You can also use it to remotely activate doors, as well as identify them as active, malfunctioning, or encrypted (locked) at a distance. Next comes hacking CCTV cameras, which not only gives you the usual ability to scout out other areas, but likewise extends your door opening abilities, letting you activate any unlocked door in the camera’s visual range. The final aspect of the game is combat. You eventually find a weapon, and you would imagine that you are in for a standard shooter. Such is far from the case. 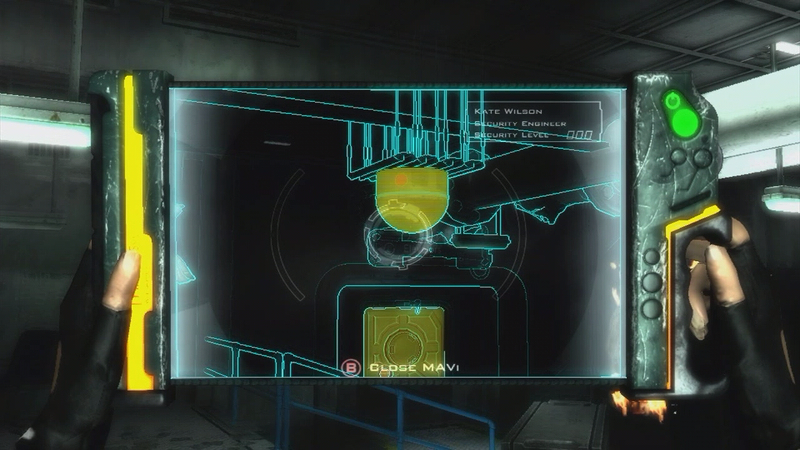 The gun begins with stun rounds which, even when fully charged, only knock an enemy down. If you want them dead, you’ll need to hit them three times, or look to the environment. I thought that I would be dealing with the usual “blow up an exploding barrel to kill a bunch of guys” version of environmental damage, but there is much more to it than that. There are electrical panels and gas leaks to go along with those barrels, and the more creative you get in using them, the more points the game gives you in the form of multipliers. Why switch to the semi auto or rapid fire rounds the game eventually gives you to kill an enemy. It is much more fun to knock a barrel down with one shot, send it rolling down the hall with a second one, then detonate it when it is behind the enemy ducking for cover. Then you can clip the power line to electrify the catwalk to zap his buddies, and when things start to get out of hand, take out a glass wall and flood the hall. Once water comes into play, the game changes entirely. Now stunning a guy is good for a kill, since an unconscious baddie doesn’t know to hold his breath, does he? Popping the glass when it is next to a foe sends a wall of water rushing at him, knocking him around like a rag doll and probably throwing a few extra barrels into play. Break enough glass and you can put the entire hallway underwater, turning what was a run and gun into a life or death balance of holding your breath and filling your enemies full of holes. The water does more than switch you into a swimming animation, too. There are currents and waves, forcing you around and slapping you against walls if you open the wrong door or drop a mass or explosion into it. The presence or lack of water is so important in this game, in fact, that not only are many puzzles solved by finding a way to flood or drain an area, but the decision to open a door is often dependent on the water level on the other side. Your mavi is good enough to paint the door blue up to the waterline to let you know if you are going to be hit in the face by a tsunami as soon as you press X. The good news about the water is that you aren’t the typical landlubber hero with lungs the size of a thimble. You can hold your breath for quite a while, which has the blessing of letting you take your time exploring flooded areas, but the curse of potentially leaving you twenty seconds from the nearest source of oxygen when the screen starts to go red. Not everything about the gameplay is great, though. The controls can be a little less than intuitive. You do most of your climbing with Y, for instance. Up+Y makes you vault up to the next grip, left and right +Y make you fling yourself in that direction. Down+Y, then, should make you drop down, but instead it makes you leap away from the wall. B is the drop down. I died during a timed sequence more times than I care to admit thanks to that little quirk. 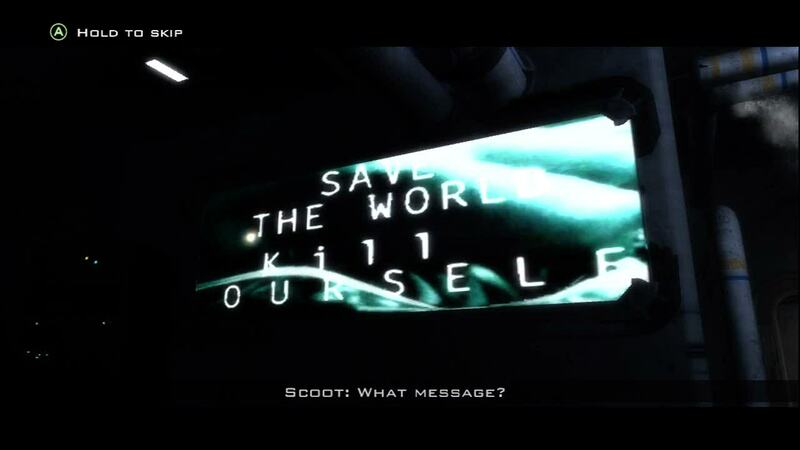 Rather than A being used for context sensitive stuff, X plays that role. A is mostly for dodging and cover. You get used to the controls quickly, but the learning curve is steeper than it had to be. Swimming can be a little quirky, too. B and Y are quick dive and quick surface, respectively, but pressing in any direction while you do it stops the change in elevation rather than steering you. Alternately you can guide your swimming by tugging at the view stick, but that’s not obvious at first, and when you are desperately searching for an air pocket, doing an aquatic pirouette rather than going through a doorway can be literally lethal. The last thing, and this is really just a pet peeve of mine, is the subtle but prevalent backtracking. Opening an encrypted door isn’t just as easy as finding a key. You have to find one, either on a corpse or a tabletop. It will then give you the ability to follow hidden arrows on the walls with your mavi, eventually finding a set of symbols called a cypher. Once you have THAT, you can unlock the door. The extra level of abstraction between key and door is neat, but I kept forgetting I had to do a scavenger hunt after finding the key, which led to me tracing my way through areas a few too many times in frustration. When it comes down to it, the game gives you an epic tool box of platforming, hacking, and view skills. With so many tools at your disposal, it is easy to forget that if you can’t reach that vent, you don’t necessarily have to find enough water to flood your way to it when you can just climb the pipes. That said, having too many options isn’t really a bad thing, is it? Item collection, a high score system, and in game medals similar to achievements round out the title and add serious replay value, and that’s before you even unlock the challenge room that throws wave after wave of enemies at you to kill with the most creative methods you can devise. Just to spice things up, in challenge you get hydrokinetic powers, so that pool of water is a tower of aquatic fury just waiting to hurl whole shipping containers at your enemies. Yes, it is as fun as it sounds. The sound of the game didn’t make much of an impression on me. The music is subtle and adequate, and for the most part the voice work is on par with the graphics, above average for an XBLA game. 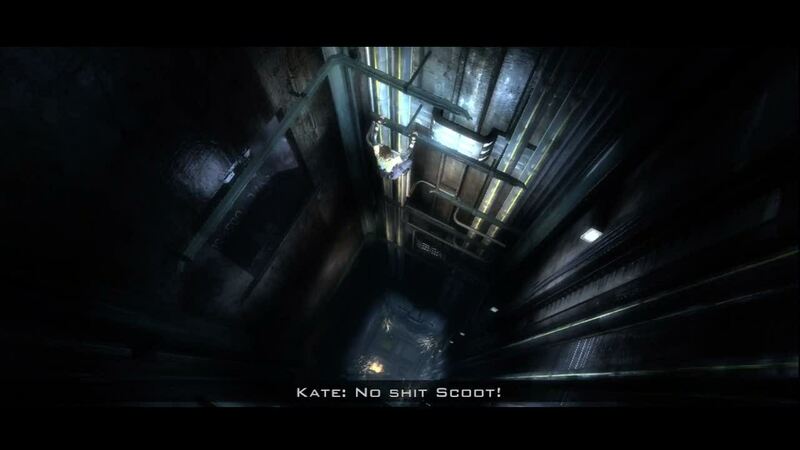 One thing I enjoyed thoroughly was Scoot, the obligatory ‘voice on the other end of the radio.’ Scoot has the typical Scottish accent, and along with the a few terrible puns, he even flirts with breaking the fourth wall by providing a verbal audio queue directly out of The Legend of Zelda. Good work, Scoot. If you keep it up we might even give you the T and the Y you need to officially be Scotty. Like most other aspects of the game, the story is deep and above average. There is actually far more to it than I managed uncover. What you mostly know is that there is a cult called the Neo Malthusians that are trying to take over the city ship called The Queen of the World. There has been something called “The global population flood”, and the bad guys are throwing around the slogan “Save the World, Kill yourself” which is a tough position to sell the public, I think you’ll agree. The level of depth of the story is dependent entirely upon your dedication, because documents are hidden on walls, in documents, and on bodies, each adding different accounts and explanations of what is going on. I don’t want to spoil anything for you, but I will say that the ending was a bit abrupt for my tastes. This game is clearly a showcase for a VERY good engine. I love the water effects, I love the enviro-kill combos, and the Metroid Prime Style scanning and Tomb Raider style platforming all work well for me. With so much you can do, and so many ways to interact with the world, the learning curve can be a little stiff, but the second and third trips through the game a completionist will take to collect all of the items and medals won’t be plagued by that problem. All in all a slightly short duration and a few control and navigation issues are the only real failings for this game. I not only enjoyed it, but I’m eager for a follow up to fill out the story and provide me with a few more playgrounds to splash around in. 8.2 / 10. A good game overall, with fantastic water effects to offset sometimes quirky controls.